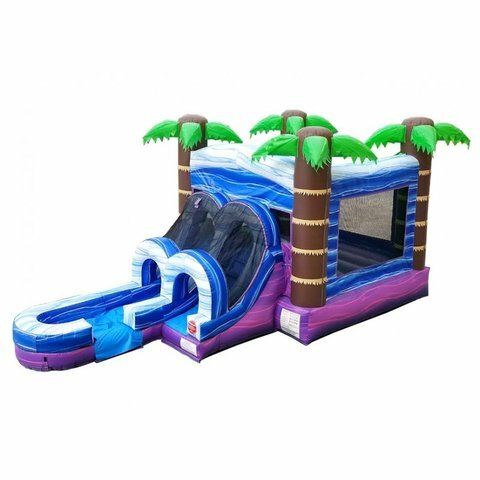 Escape to a wonderful island paradise with the kids’ Tropical Bounce House and Slide Combo. The setup area required for this one-of-a-kind bouncy house is 35 x 25. This tropical bouncy castle can be set up a variety of surfaces, including asphalt, concrete, grass and dirt. For one low price, you’ll enjoy four hours of bouncing fun! This bounce house is decorated with four inflated palm trees, one at each corner, and bright, tropical colors that add to the theme. This bounce house features screened sidewalls to keep kids safely inside the bounce house while parents easily supervise from the outside. When kids are finished bouncing, they can go down the slide. The attached mini slide features bumpers on each side to safely keep little ones on the slide as they go down. Reserve the Tropical Bounce House and Slide Combo for your child’s party today!